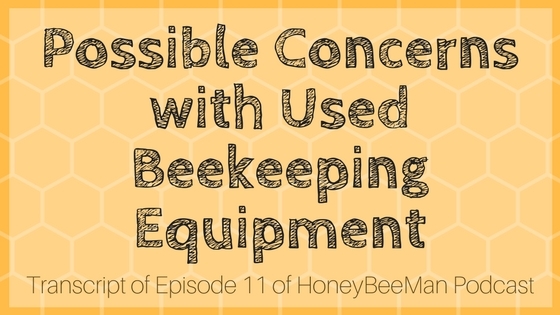 The following is a transcript of Honey Bee Man Episode 11 – Answering a question about used beekeeper equipment. The combs are the beeswax built in a colony. You put foundations of wax inside the hive, they’re held in place with a wooden frame. Once you put that wax foundation in there, that wax foundation is flat and it has hexagonal cells imprinted on that flat sheet of wax. The bees build this wax out to where it’s about three-quarters of an inch deep on both sides, so all together this piece of wax frame the is a movable frame that you can lift out of the hive is built up of these wax honeycombs. Those honeycombs are where the bees raise their young and also where they store honey. The honeycombs all look the same in the top honey supers versus in the bottom of the hive, with the exception of the frames used to raise brood tend to get dark as they age. The older they are, the darker that wax looks. The dark wax is really not a problem. You should be able to reuse that without any problem at all, as long as it’s good straight comb without too many holes in it. The bees will occasionally chew a hole through the wax so that they can go from frame to frame easier. If they have a lot of holes and a lot of really odd wax that is not in a straight nice formation, then you may want to consider replacing those frames. If the wax is nice and uniform and they have good sheets of foundation, then there is no reason in the world that you can’t reuse that. I would say absolutely reuse it. Even if it’s dirty, filthy dirty, the bees will clean that out within less than a week. It’s amazing how bees will clean out a hive. Any impurities in those cells they’ll get rid of and they’ll clean them out. They’re not going to do anything about the blackness of the wax, that’s pretty much inherent with the wax, it’s not really an issue for the bees. 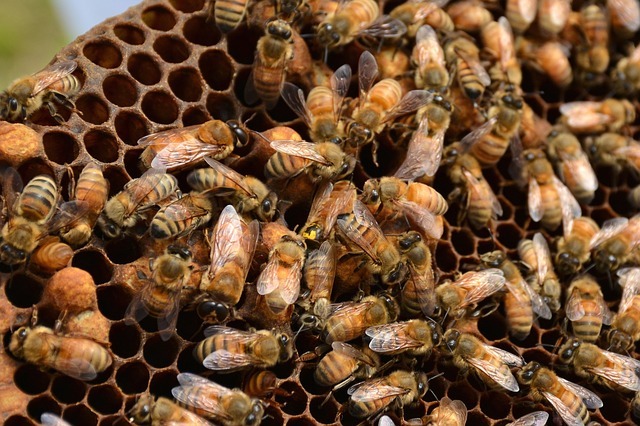 The only thing you would have to be concerned about is if there is any contamination in the wax left over from treatments that the previous beekeepers may have used for treatments. Some of the mite treatments used over the years may have some chemical residues that may be left in that wax. Another concern might be that there is the possibility that there are certain diseases that could have caused the loss of the original hive in the first place, those diseases may still be contained in the wax that’s in the original hive. Those are my two concerns. They’re not really big concerns. If the wax looks like it’s in pretty good shape, then you’re probably going to be fine. You should be able to reuse all of these hive bodies and start yourself a new hive in there without any problem at all. You have a frame and a half of honey. That’s probably 70 or 80 pounds of honey, it sounds like. If half of what you got out of the three boxes is full of honey, that’s quite a bit of honey there. It’s probably not fit to eat for human consumption, because if it’s old and it has been sitting around then you don’t know what kind of varmints have been in it. It could have had ants, mice, or any number of other predators going after that honey. What I think I would do with that honey is go ahead and leave that honey there. Just dump your new swarm in on top of it and they will probably eat that up. If it’s a new swarm or a new package of bees, they’ll probably eat that up in the springtime. When you put the new swarm of bees in there, they’ll probably eat that up right away as they get started and as they build their nest. Then they will produce new fresh honey based on what they need for their hive. They’ll use that old honey as a food source to get themselves started. You should be able to leave it there. The one drawback with leaving that honey there is that when you put that outside you could have some robbing from other hives nearby. My concern would be robbing, you don’t want a brand new hive to be robbed out with a bunch of bees from other hives. There may be other hives nearby that you’re not even aware of. If you are going to leave that honey on this hive, you probably need to use an entrance reducer and reduce the entrance on the hive so that it’s very small. That will give three or four holes that are very small that the bees can protect, and even then sometimes robbing can be an issue when you have honey out, especially in times when there’s not a nectar flow on. As long as you’re putting them out in the springtime and you know you have a good nectar flow going, then you should be fine. The robbing is a situation that you do kind of have to watch out for. If the time is unknown on how long this honey has been in those frames, I’d be a little reluctant to try to extract that honey. I think I would go ahead and feed it back to the bees. Other beekeepers might disagree on that, but that’s just my two cents on it. That’s probably what I would do is leave the whole thing there, put the two deeps on the bottom, put the queen cage in there, dump the bees in, close it all up and let them have that honey. I’d put an entrance reducer on it so that you don’t have too much robbing and let it go and see what happens. Check on it in a week and see if the queen has released herself out of the queen cage and you should be good to go.